"Help them" are the last words of a dying man who had no hat, no gun, no horse and massive callouses on his hands. 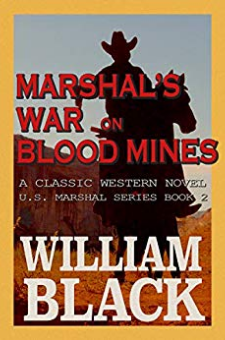 US Marshal Clint Riley is suddenly staring at a nefarious mining operation in Colorado Territory.Dozens of citizens and an entire Indian village go missing. Innocent men, women and even children are threatened, abused and some killed.This biggest and most wicked crime in Old West lore has to be exterminated - at its roots.Together with his deputy Jasper Teel, Riley saddles up to investigate this nefarious operation. The US Marshal uses his wit, brawn and law enforcement skills to try to bring the evil mastermind Jace Tyler to justice.But Tyler is no fool. He is an experienced outlaw. He is a former Confederate officer with links to the infamous Andersonville prisoner of war camp, which claimed the lives of 13,000 Union troops.Riley and Teel are joined by the courageous Navajo Indian, who believes in the justice cause of the white men duo, despite the earlier grievances inflicted upon his tribe by the gang under Tyler.Along the way, Riley has to save the beautiful Claire Sloan and her missing father.Riley is leading an uprising against blood mines. But Tyler and his villainous horde stand ready for the lawman - with fully loaded rifles, guns and even dynamites.How will the savvy Riley free not just one mine but several, and let them see the light of day again?Note: Each book in the U.S. Marshal series is a standalone story that can be read out of order.